West Seattle provides a good test of golf, but don't get so focused that you forget to take in the views. 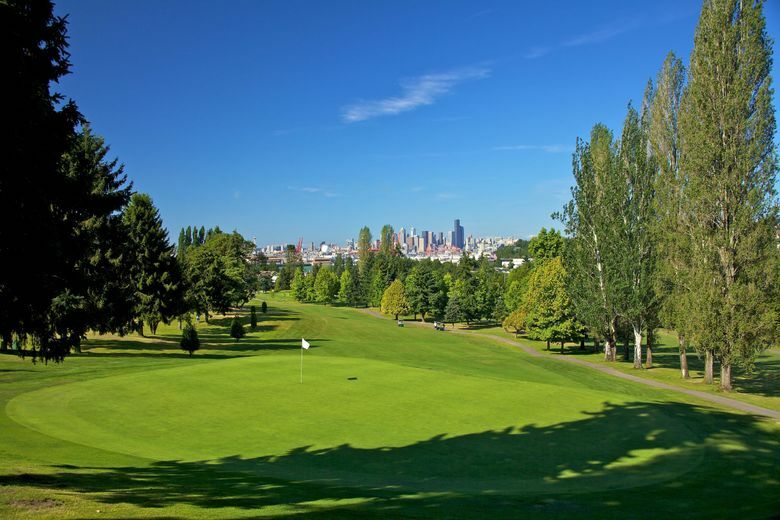 In part five of this series reviewing golf courses around the region, Seattle Times golf writer Scott Hanson and golf writer emeritus Craig Smith head to West Seattle Golf Course, which provides the toughest test of Seattle’s public courses and some great views of the city. Before we start, I (Hanson) have to give full disclosure. West Seattle is the course that is closest to where I grew up, where I played nearly every day during a couple summers in high school, and I have a father who believes West Seattle is unquestionably the best course in North America, a notch above Pebble Beach and Augusta National. I admit I also have a soft spot for the course, but I have to be honest, and I will. I just hope my dad still loves me after he reads this. Hanson: It’s been years since I had played West Seattle, and coming back I got the same feeling you get when you see a good friend after a long time. One reason I quit going to West Seattle is that the course can beat you up if you are not playing well, and I have mental scars that go back 40 years. The course remains the most challenging of the city’s three 18-hole public courses, with a great variety of holes, particularly the first 13. Smith: Good, solid municipal golf course the city of Seattle can be proud to own. First impression of clubhouse would have been better if there weren’t some dandelions growing near the building. Yardage: Black, 6,805; white, 6,030; gold, 4,756. Rating/slope: Black, 71.5 and 125; white, men 67.9 and 121 and women 73.3 and 126; gold, men 62.5 and 97 and women 66.2 and 110. Hanson: This is a great place to come if you are looking for challenging, well-designed holes that make you feel like you’re far away from the city, except for the ones that have amazing views of the skyline. And it comes at a good price, particularly if you get one of the off-time specials. It took less than 4½ hours to play, even with the marshal adding a friendly fifth player to our group midway through the round. The last five holes are not nearly as good as the first 13 (they go back and forth, with little imagination), but are still challenging, particularly the uphill 14th and 16th, which can have diabolical hole locations. When I was a kid, the story often was told that the architect died after designing 13 holes, and thus the rather unimaginative finish. As a journalist, I should confirm this, but after believing it for four decades, I am not sure I can handle the truth. And I passed the story along to my playing partners while enjoying excellent food in the clubhouse (whether it was the fish and chips, fish tacos or club sandwich). Smith: Course is long enough and tough enough to provide challenge for scratch golfers but can be enjoyed by recreational players, too. Good history: Held the 1953 U.S. Public Links Championship. Designed by H. Chandler Egan, two-time U.S. Amateur champion whose accomplishments include the Eugene Country Club and Indian Canyon Golf Course in Spokane. (Sorry to spoil your preferred history, Scott, but what I read said Egan designed the course in 1935, died of pneumonia in 1936 and course opened in 1940). The par-5 12th hole, with a view of the Seattle skyline, is one of prettiest and most memorable holes in the state. Club sandwich and fries were delicious. Hanson: I have never liked starting with a long par-5 without a driving range to get you ready. The condition of the course, while not bad, is what you would expect at an affordable municipal course and would be a step down for those who play at high-end courses and country clubs. In the winter, the course can get very muddy (even my father begrudgingly admits this), so take advantage of it before the winter. Smith: No range. Last five holes are back and forth. “Well, at least the ball went farther than your divot,” Smith to playing partner Brett Miller after Miller complained about a long approach shot that traveled about 15 yards. The 8-year-old son of the player who joined our group during the round, rolling down the hill above the 16th green and onto the green, clutching his stuffed octopus and laughing loudly while two members of our group were putting balls so poorly they rolled off the green. Hanson: 3. This is an interesting and good test of golf at a fair price. Sorry, Dad, I can’t give it a 4, but it’s a solid 3, maybe even a 3-plus in the summer. Smith: 3. Life would be good if all municipal courses were of this caliber.